The Whooping Cranes (Grus americana) is a very large crane. It is the tallest North American bird and the only crane species found solely in North America. Adults are white; they have a red crown and a long, dark, pointed bill. They have long dark legs which trail behind in flight and a long neck that is kept straight in flight. Black wing tips can be seen in flight. Immature birds are pale brown. Their breeding habitat is muskeg; the only knownnesting location is Wood Buffalo National Park in Canada and the surrounding area. They nest on the ground, usually on a raised area in a marsh. The female lays 1 to 3 eggs. Both parents feed the young. Usually no more than one young bird survives in a season. The only known wintering location for these birds is Aransas National Wildlife Refuge in Texas which was created to preserve their wintering grounds. These birds forage while walking in shallow water or in fields, sometimes probing with their bills. They are omnivorous, eating insects, aquatic plants and animals, crustaceans, seeds, and berries. This species' name comes from its whooping call. 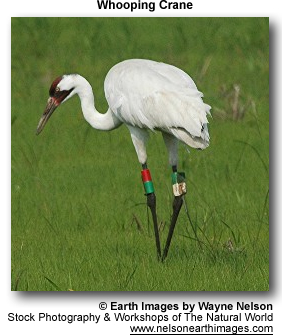 The Whooping Crane is endangered mainly as a result of habitat loss. At one time, the range for these birds extended throughout midwestern North America. In 1941, the wild population consisted of 21 birds. Since then, the population has increased somewhat, largely due to conservation efforts. Recent estimates suggest that there are about 336 Whooping Cranes living in the wild, and another 135 living in captivity. Attempts have been made to establish other breeding populations in the wild. One project involved cross-fostering with Sandhill Cranes. The Whooping Cranes failed to mate and reproduce; the project was suspended. A second involved the establishment of a non-migratory population near Kissimmee, Florida. This population currently numbers about 58 birds; while problems with high mortality and lack of reproduction are addressed no further birds will be added to the population. A third attempt has involved the reintroduction of the Whooping Crane to a new flyway established east of the Mississippi river. 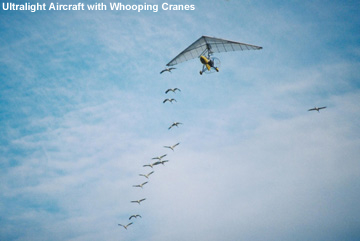 This project uses isolation rearing of young Whooping Cranes and trains them to follow ultralight aircraft. These birds are costume reared from hatching, taught to follow an ultralight aircraft, fledged over their future breeding territory in Wisconsin, and led by ultralight on their first migration from Wisconsin to Florida; the birds learn the migratory route and then return, on their own, the following spring. This reintroduction began in fall, 2001 and has added birds to the population in each subsequent year. As of April, 2006 there are 64 surviving Whooping Cranes in the Eastern Migratory Population (EMP), including 19 yearlings lead by ultralight aircraft in fall, 2005 and 4 yearlings released in Wisconsin and allowed to migrate on their own (Direct Autumn Release (DAR)). Fourteen of these birds have formed seven pairs; two of the pairs nested and produced eggs in spring, 2005. The eggs were lost due to parental inexperience. Thus far in spring, 2006 some of the same pairs have again nested and are incubating eggs. Two Whooping Crane chicks were hatched on June 22, 2006. Their parents are both birds that were hatched and led by ultralight on their first migration in 2002. At just 4 years old these are young parents. The chicks are the first Whooping Cranes hatched in the wild, of migrating parents, east of the Mississippi, in over 100 years.